In a letter sent today, the Bicycle Coalition of Greater Philadelphia formally asked the Board of Commissioners to restore funding for the Walkway Ramp Capital Project. 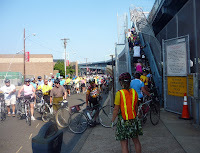 "On behalf of the hundreds of cyclists and pedestrians who use the Ben Franklin Bridge daily, the hundreds of thousands of bicyclists who ride throughout the region, and the over 2500 members of the Bicycle Coalition of Greater Philadelphia, I request that you restore funding in the 2012 Capital Program Budget for an ADA compliant ramp on the Camden side of the Ben Franklin Bridge at your December 14th meeting," said Alex Doty, Executive Director of the Bicycle Coalition of Greater Philadelphia. "Because it is DRPA's mission 'to provide quality transportation services across the river and invest[s] in the economic growth of Southeastern Pennsylvania and Southern New Jersey,' it must prioritize building the ramp as a 2012 capital project." The DRPA Finance Committee, with no public notice about its agenda, on December 7th approved a 2012 Capital Budget that omits Capital Project BF1101 to build the ramp, which has been in the 5 Year Capital Program for over five years and delayed several times. At a July 2010 Board meeting, CEO John Matheussen promised that the ramp would be built in 2012. The Bicycle Coalition's letter also makes the point that "eliminating this project goes against NJ's Complete Streets Policies and continues to deny the public ADA access to the Ben Franklin Bridge Walkway. The ramp connects directly with the $6 million regional trail investment made by the 2010 federal TIGER Grant awarded to Camden, which Coopers Ferry Partnership is now implementing. NJ DOT is providing support and guidance for the TIGER project and even delivered a cost estimate for the ramp. The lack of a ramp is a critical obstacle to the region’s trail network and is a deterrent to Camden and Philadelphia’s economic development efforts to enhance the Delaware Riverfront." Over 200 people have signed the petition asking DRPA to restore funding to design and build the ramp in 2012 and many have left their own comments about why it is so important for the Ben Franklin Bridge to have this ramp. The Bicycle Coalition will bring the petition signatures to the December 14th Board meeting at which the Commissioners will vote to approve the Capital Budget. Take action by signing the petition! 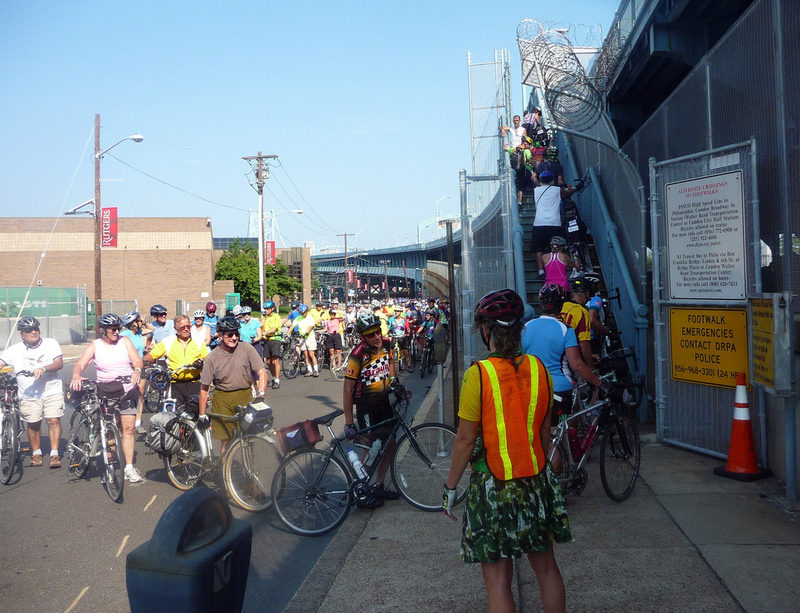 If you can make it, come to the December 14th Board meeting at One Port Center in Camden at 9am to demonstrate that bicyclists and walkers deserve their vote to restore funding for the walkway ramp.